You forgot to download LeapFTP	. Click the link below to download it. FTP can be considered the most efficient solution for uploading and sharing files online. That's because it has a series of advantages over other methods of sharing files, like for example sending them through email. But in order to access FTP websites and upload files, you will first need to install a FTP client. Fortunately, there are numerous clients on the market to choose from, but only some of them really offer the functionality desired by the average user. An example in this case could be the LeapFTP application. 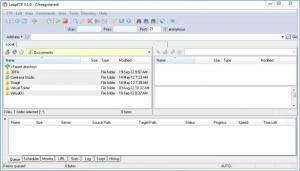 This Windows FTP client allows you to connect to any FTP website and perform file and folder operations in the same manner as using Windows Explorer. After installing and launching the program, the user will notice that the interface resembles the one of a regular file manager, displaying two file panels, one next to the other. The first thing to do is to enter the FTP server, username and password, in order to connect to the FTP website. At this point, the user will see all the files and folders stored on the FTP server in the right panel and the local files in the left. He will be able to copy or move files from a side to the other using drag and drop or by using the right click menu. For making it easier to access FTP websites, LeapFTP includes a Site Manager, in which you can add all the details regarding a FTP website, including the username and password. As such, you will be able to connect to it in the future just by clicking on its name, without having to enter the username and password over and over again. By accessing the settings area of LeapFTP, you will be able to completely configure the program's functionality. Still, some features may be a bit more difficult to understand by inexperienced computer users. It allows you to connect to any FTP website using the quick connect mode, which only requires entering the FTP server, username and password. Besides that, the Site Manager can keep complete details regarding a FTP website. Furthermore, you can perform file and folder operations using drag and drop. What's more, the settings area includes complete options for configuring the program's functionality. Some configuration options may be difficult to understand by beginners. LeapFTP is a simple solution for connecting to any FTP website and perform file and folder operations using drag and drop. You can download LeapFTP free here.